Today I get to give away something I adore! My friend Melissa from the blog Midwest Magnolia and new Etsy shop, designed and created this very special pillow cover for me and I LOVE it. I am also the owner of one of Melissa’s laptop bags, made with the same adorable fabric. In fact, it was because of my laptop bag that I ended up with this pillow cover. I loved my laptop bag so much when I saw it sitting on my sofa that I almost tried to stuff a pillow in it. Fortunately, Melissa saved me from myself and made me a real honest pillow cover. And if you are the lucky winner of today’s giveaway, she’s going to make a pillow cover for you too! I don’t even have to give my own pillow away, she’ll make one just for you. Visit Melissa’s blog Midwest Magnolia and her new Etsy shop! And then leave a comment here to enter the giveaway! One entry per person today! Pure and simple. If you want to shop, Melissa is also offering a discount coupon code for her Etsy store for 20% off a purchase of $50 or more for my readers. Just enter “InspiredRoom” in the coupon code at her shop. This is good through the 15th of September. PS. I featured Melissa’s son’s nursery awhile back on Room Tours, check it out! So cute! I love that you posted this Etsy shop and blog. Her products are wonderful! Lovely pillow….reminds me of a art journaling page I once did. Would proudly display this on my bedroom chair. Would go nicely with my colors in there. The laptop and kindle sleeves are adorable, but I’d LOVE a beautiful new pillow the most!! Thanks for the chance to snag one for my own!! I love these patterns!! I’m a southern gal too living in the city so anything that reminds me of the south is fantastic. The colors are so inviting. Can’t wait to shop around and I get the giveaway to start it!! The pillow cover is gorgeous! I would love to win it! Now I am heading over there to check out the other stuff! The colours and patterns are so cheery in her designs. Thanks for introducing us to this great blog. What a cute Etsy shop! Count me in, I have a thing for pillows! EVERYTHING she has is darling….but my choice would have to be a beautiful pillow! Thanks so much! A very pretty pillow for my for my white sofa too! It would be a great Happy Birthday to me gift! If I miss out on the pillow please send me Jack :))) – I love him he’s sooooo adorable. Love the pillow, and the ipads sleeves are cute too! The new pillow looks great! She uses such fun fabrics! Thanks for hosting this giveaway. Oooh, I love the fabrics that she uses and those makeup bags are so cute. Thanks so much for having this giveaway – great idea. Oh how I wish I were that talented…I’m loving that pillow! I completely understand why you wanted to stuff a pillow in one of those laptop bags! Omigosh-want. =) Thanks for the giveaway Luv. Love those laptop bags and to have those colors as a pillow would be fantastic. Have a great weekend. Cute pillow! I also love the Nook cover she has on her Etsy site. With our daily life trials as this economy goes up and down I truly found a happy spot in the Inspired room and Melissa’s blogs. Wow! What wonderful prints and a terrific eye for colorful design patterns. I thank you both for creating these blogs…they help make my days pleasant ones and oh so inspiring. I think these are so cute! What great designs! So me…. Hubby is picking up and iPad today for my belated BD gift. I would be thriled to have the cheery iPad cover. It is really sweet and different. I would love to buy the pillow but, we are on a 30 day no spending challenge which started the 1st. ARG…. I will definitely bookmark her site for when we end it though. Thanks for introducing us to her. Her etsy shop is beautiful. I enjoyed my visit and would love to have one of her beautiful creations. I now follow her blog. I love her make up case. I love the pillow- I would be thrilled if I actually could be the winner. I have an i-pad so I am considering ordering a cover for that-so cute! So love this pillow. Love the contrast in the top and bottom and the sweet little flowers! Thanks for offering the contest. I would love one of those cute laptop covers! The pillow is adorable but how have I missed the fabric on the window behind the chair! So cute! What is it and where is it!?! I will be following Melissa now! Just from my short look at her blog I can tell we have a TON in common! Thanks! The pillow is gorgeous! Perfect for our bedroom chair! I would LOVE a pillow cover! So far I only have about a million pillows that I rotate in and out with the seasons and I am running out of room! A pillow cover would be fantastic – I’m redecorating my great room & it would sure come at a great time. Her shop is full of so many lovlies – thanks for a chance to win. Hey girl….you just introduced me to a fellow Iowan so I had to put the welcome wagon hat on and comment on her blog. Thank you. I love meeting Christian bloggers in my own state. And the pillow is adorable. I want one too. I am eyeing one of those Ipad bags but first have to get the Ipad!! Have a blessed Sunday! Great pillow! Thanks for doing the giveaway. Great Pillow Covers! Would love to win one for my new couch. Hey! I love the look of the pillow…you have good taste!! Super super cute!!! I’d love to have one of her custom pillows, beautiful!! Thanks! Lovely!!! Thanks for letting us know about her. Love Melissa’s products! Thanks for the share and have a most excellent weekend! I LOVE the combination of the different fabrics! Would love to win this pillow cover, and might have to check out ordering the ipad cover in this pattern. Beautiful! Melissa is a sweetie! It’s been fun for me to get to know her just a bit through her blog and on Facebook. I *love* your new pillow cover. It seems to be one of those unique color designs that transcends the styles and seasons. I’m wondering if it will be offered in her new Etsy shop soon? Blessings to both Melissas for this sweet giveaway!!! Diane, you are just too sweet! It’s in the shop now:) Sorry I was a little late in adding it. I have been lusting after that mustard fabric with the berries for months! I found it at Joanns and almost bought tons of it, but couldn’t quite justify the use of it in my home at the mome. And as a poor college student, it’s only the essentials for me right now. I LOVE both the pillow and laptop cover in this fabric. I hope I win! Many thanks to both of you for this delightful prize giveaway! Just got back from Melissa’s blog and shop. A lovely woman with a huge heart and many talents! It looks like a lot of work goes into her laptop covers, and I love the combination of fabrics she uses! I would be honored to own something she has created. How creative. I love the make up bag. Love the pillow cover! Would look great in my family room. Ohhhhh-I love your website! It truly inspires me to be a better person. I would love a chance at that beautiful pillow. It is so refreshing and unique. Bless you for sharing your gifts and talents with those of us who need a little or maybe a lot of inspiration. I love the patterns and fabric she uses…so cheerful and charming! I would be absolutely thrilled to win a pillow Melissa! Even her makeup bags are gorgeous. Love her fabric and color choices! Very cute designs and our living room is in dire need of new throw pillow! Such pretty things! And I love that they don’t take themselves too seriously, if you know what I mean. I have a place picked out for the pillow. :) Thanks for the opportunity! I immediately fell in love with that pillow cover the moment I saw it, and then seeing there was a giveaway, I got even more excited! I would love to win this – thanks for the opportunity! I can’t wait to visit her shop! Very pretty! We just moved and don’t have as much to decorate with…so I could definitely find a place for such a pretty pillow! Um, that might be the cutest pillow I’ve ever seen. The pillow is precious. I am working on redoing our guest house living area and the pillow would be a perfect beginning. Love it in the white chair as that is what I thinking of. Thanks for such a great giveaway! I have the perfect spot for a pillow like this! I’d LOVE to win it!! I am pulling together a cozy beach cottage in a month’s time and on a teeny budget! Thank goodness for Craigs List. Melissa’s Gypsy Spirit pillow caught my eye and would look great in the living room. Cute stuff! Love’s Melissa’s stuff! This pillow would be a great jumping off point for my new living room design! Your pillow is darling and I love the other ruffled one in her shop! I also adore her make-up bag and wondered if it is washable. Love the pillow. The design and colors are great! 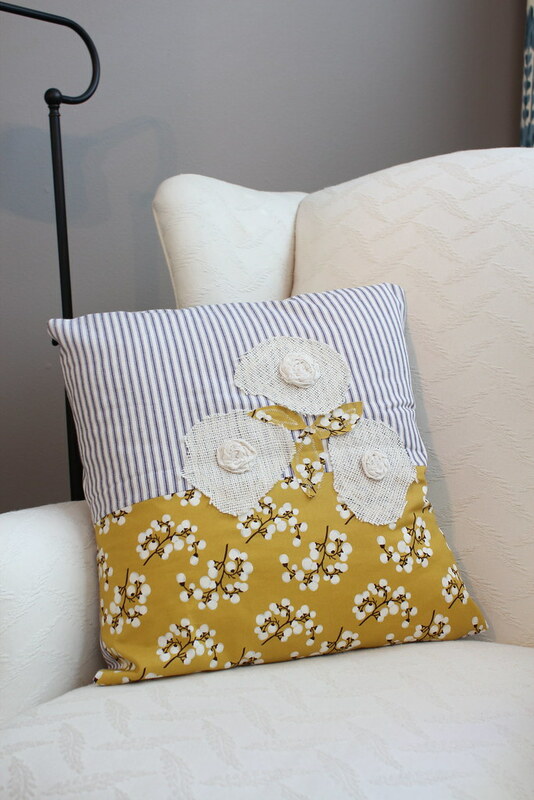 Fun giveaway with this pretty pillow. What a cute pillow! Fresh and fun! What a darling pillow. New to your blog…and loving it! What an uplift in the midst of packing our home to move soon, to take a break and visit your blog and see the beautiful pillows, etc that Melissa makes! I will be a regular visitor to her blog and etsy shop! I would love to win a pillow! Our spare room is desperately needing something! way cute…would love to win. I just love this pillow so sweet! Going to her etsy shop right now. love the colors, cute pillows! I was just thinking I want some new pillows for the living room and master bedroom. This one is fab, I would love to win one, but regardless my creativity is inspired! Love this! I hope she starts to sell them in her store! These are super fun- I love the mix of fabric. oh, my! just what i need, another etsy shop to obsess over. so, so cute! Sweet!! So much talent! I would oh so love one!! Thanks for the chance – I so enjoy your blog, BTW!! God love you!! Love her stuff!! Would love to have this pillow to put in my study! Such a cute shop and blog! Very talented lady!! That pillow is adorable and so is her site! so much talent!!! love all the items! Love the pillow! Perfect mix of color and texture. So charming! Love the gypsy pattern! It would give a much needed dash of color to my living room. Gave me a whole new idea of the direction to go with my decorating. Thanks for sharing the Midwest Madnolia site – love it and am now a fan. She sure does make some cute stuff! Great contest! I LOLed reading about you wanting to stuff a pillow into your laptop bag. The pillow covers are darling! I think those would add some vibrancy to my chocolate-brown leather couches. I also love Melissa’s blog, i’m totally adding her to my long list of daily reads. What an adorable pillow, love the color combos! Okay, I have been at her site for far too long. Cute stuff!!! Loved that you thought to stuff the laptop case…tht sounds like something I would try to do. I love your pillow and Melissa’s work! Fingers crossed….hope I win! Thanks so much for the chance to win. Love your pillow! Love the very colorful pillow on her website. Thanks for the opportunity to win! Blessings. What a great pillow! Original design. The ipad and laptop covers on midwest magnolia are also wonderful- a great element of touch to the tech of today’s tools. I love her different fabrics and colors! A new pillow would brighten up my home :). P.S. I struggled with infertility, too, and now have two beautiful daughters. P.P.S. I love your blog, especially when seasons change. I get so many great ideas for my own home. Great giveaway! That ruffle pillow color is absolutely adorable! Love it! ahhh I want one! Love the colors! Just beautiful & so cheery! I would love to win a new pillow cover for my living room. I am getting ready to have my bargain sofa( beautiful , rounded corners and tufted all across the back) from a charity shop for ill children recovered. The best part that it was $30! This pillow cover may be my inspiration point so she can be as daring as she likes. I love color!! Love the ruffled one! So many pretty colors! Hope to win…would be great to have in our den. Would be a special treasure. Oh what talent she has….So cute! Thanks for the chance! very nice Etsy shop – beautiful array of colors abound in every project = nice work! delightful giveaway, her work is charming. love the ipad sleeves. i love the blues and turquiose! Beautiful pillow – love her shop! Thanks for the great giveaway! Love the makeup bags too! How cute! Ooohhh…. such beautiful work. 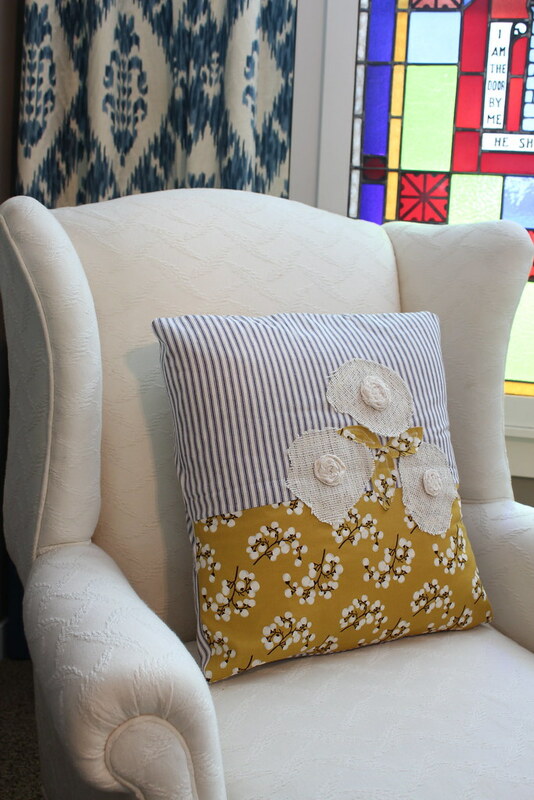 I do like the pillow you showcase, the Burlap Blue and Yellow Pillow Cover… it’s totally my style! Love her blog and website. The colors and designs are so warm and whimsical! Fun. I think I have a new blog to follow. And if I could I would buy up everything in her shop. Such cute things! Cute pillows! I have a new blog to follow, too! Very cute & very unique! Love it! Love the Ode to Cottage laptop sleeve! Thanks for the giveaway! Beautiful. I would love a pillow cover of my very own! ooh, i love the ruffle cotton pillow – it’s so cute! I found your site this morning, and now its 5.30pm lol, you have so much talen and wonderful taste…. please, tell me where you got the material for the dining room curtains !!!! Love the pillow and her work. Hope I win. Happy Labor Day. I need a sleeve for my laptop – maybe I’ve just found the place to get it! Thanks for sharing. Your pillow looks wonderful. Talented! Love the yellows she used! so many cute things in her etsy shop! I love your pillow cover! The ruffle cotton pillow cover on Melissa’s etsy page is ADORABLE!!!! I love that pillow! So cute! I visited her site and love the ruffled pillow. I also love the blue and green Ipad case but I don’t have an Ipad :( Maybe she could make me a pillow like it!! Super cute stuff!! Love her pillows! I love her Etsy shop! Such beautiful items! Sweet pillow! It’s inspiring me to think about my pillows in a new way. That is one adorable pillow and she’s got such cute things in her shop! Wow. I love that pillow too! Her stuff is adorable!!! Is there still tiem to enter? Very cute pillow! I’ve taken a look at the items in her shop and I really like her choice of fabrics! Sweet! Love the choice of fabric. Your pillow is darling.I really liked Melissa’s Etsy shop- so many lovely things to choose from.